Succulent tail-off Shrimp in a parmesan & romano cheese sauce. Get comfortable making this delicious Italian comfort food at home. 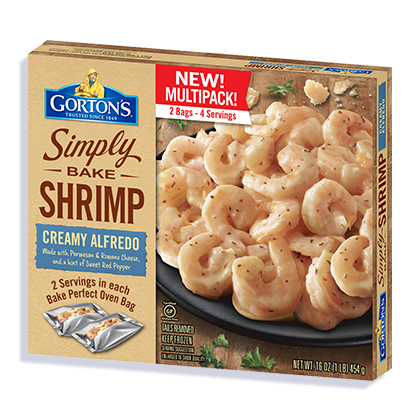 Whether you’re making a meal for one or cooking dinner for many, Simply Bake Alfredo Shrimp means you can spend less time in the kitchen and more time getting comfortable with your family or friends. Water, canola oil, modified corn starch, parmesan and romano cheese (milk, cheese culture, salt, enzymes), butter (cream, salt), sugar, modified potato starch, cream solids, salt, nonfat milk, maltodextrin, garlic powder, sun dried tomato powder, spices, citric acid, whey, natural flavor, malic acid.